Leadership is best done utilizing teamwork, then to lead focused solely on one individual. Remember “no man is an island”, not one person has all the answers and forethought to lead a company all by himself. Companies need to have a strong, well diverse team in order to succeed now a days. The team must be built with on a varied skill set, possess multiple viewpoints, be aligned in leadership and not dependent on one sole individual. A study was performed from more than 25,000 leaders from nearly 2,500 companies and over 54 countries. 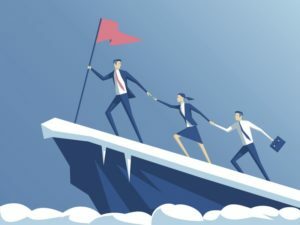 Slightly over the majority, the leaders felt they were part of the decision- making process in their companies or that the leaders really do combine their efforts for making effective decisions. Companies who used a combined leadership technique found themselves with stronger leadership and were alert and ready for what the future brought. Where team leadership was in place, companies were three times more responsive to the competitive environment. Along with this they were also three times more capable of understanding change in their customer needs and perspectives. When not working together for the greater good in the top of leadership roles, this may cause a loss of energy and passion that can destroy a company. Make sure the people in the key leadership positions have a talent and history of being a great team member. Be a company that is comfortable with diversity. Provide team-based rewards and bonuses. Have flexible teams and not teams that operate rigidly all by themselves. Establish a Call-to-Action for your organization and supply a purpose as to why you are in business, so everyone is working towards the same goals. It takes a strong team of leaders to keep a company moving forward and strong. How Small Businesses Can Survive the Holidays Are Brick and Mortar Stores really dying?